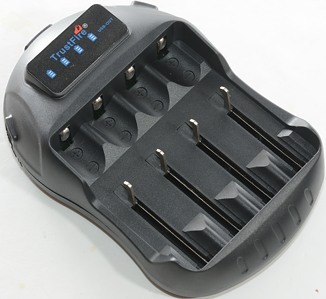 This charger can charge up to 4 LiIon and NiMH batteries at a time. 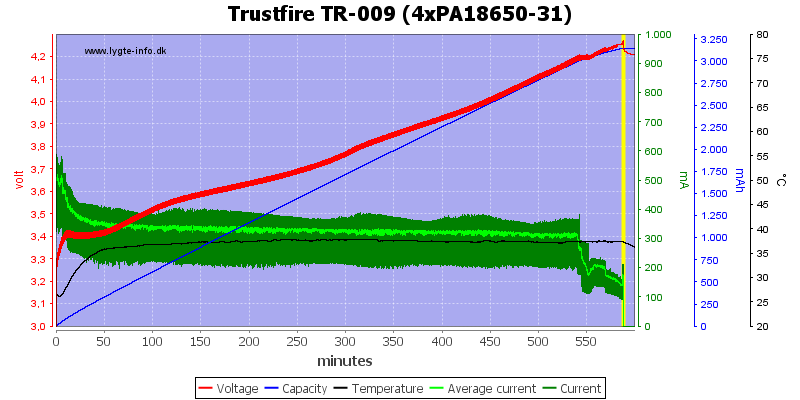 Usual TrustFire products do not inspire much trust, lets see how this one does. 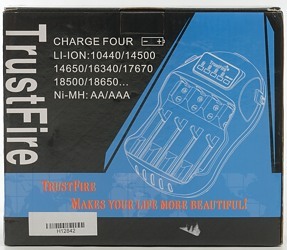 The pack contained the charger, a mains led, a instruction sheet, a warrenty card and a QC note. 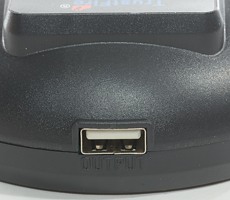 The power input is a DC barrel input. 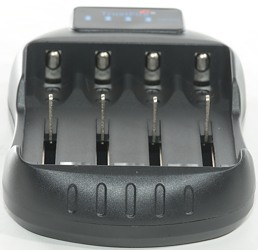 The charger has one usb output, it can use from 1 to 4 cells to power it. The user interface is fairly limited. It contains 4 red/green leds, red while charging, green at all other times, except when usb output is on. 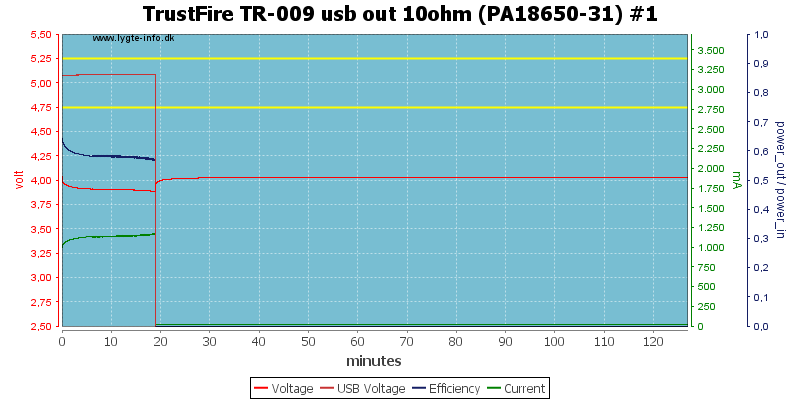 Then the usb output has its own green led that will be on when it is active. 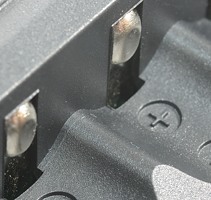 To change between charging and usb output a switch is used (C=Charge, O=usb output). 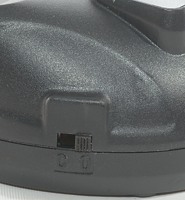 The battery slot are the slider construction, but with plastic sliders. 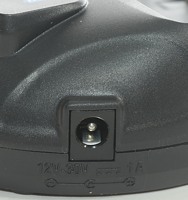 It is very smooth and has a good grip on batteries with large diameter, but smaller batteries (Like AA) can be problematic to center on the slider. 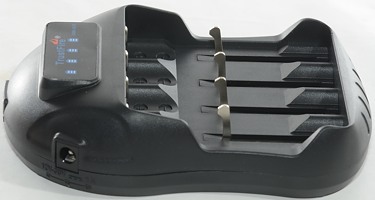 It handles batteries form 31 to 71.5mm. 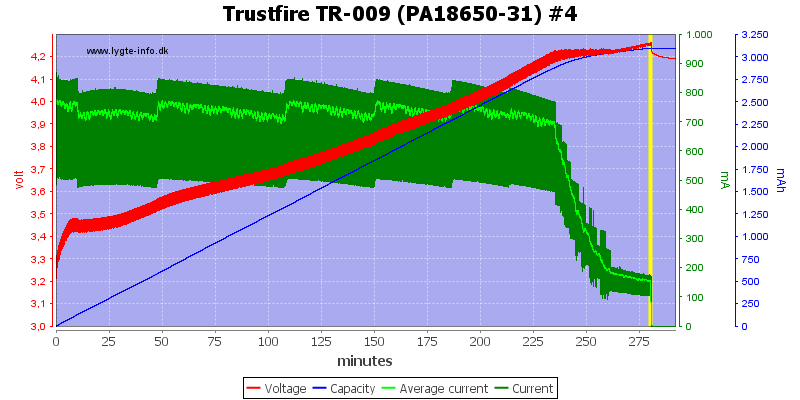 The current is a bit high for 16340 and 14500 LiIon batteries. Power consumption when idle is 0.8 watt, power supply uses 0.5 watt of that. Slot 1+3 are working together, i.e. use both slots and the current will drop. Slot 2+4 are working together, i.e. use both slots and the current will drop. 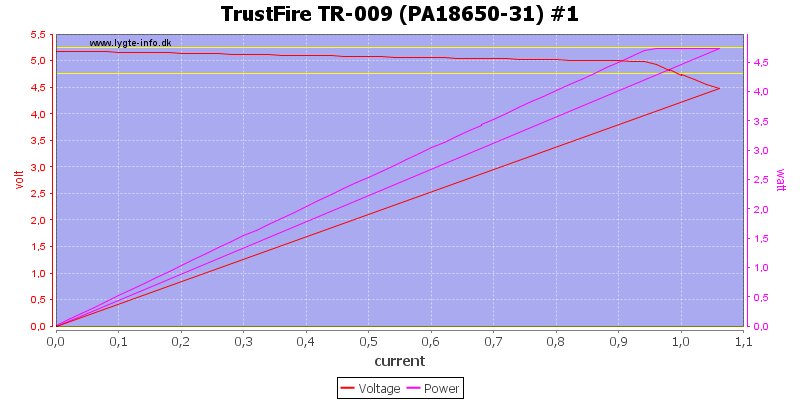 Between 0.8V and 1.5V the charger will use NiMH charging. 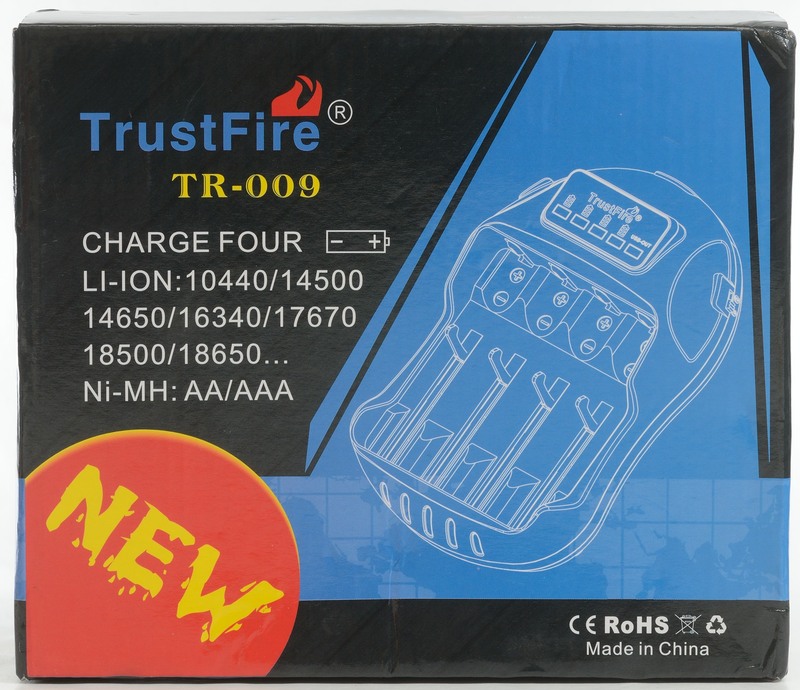 Above 2.5V the charger will use LiIon charging. 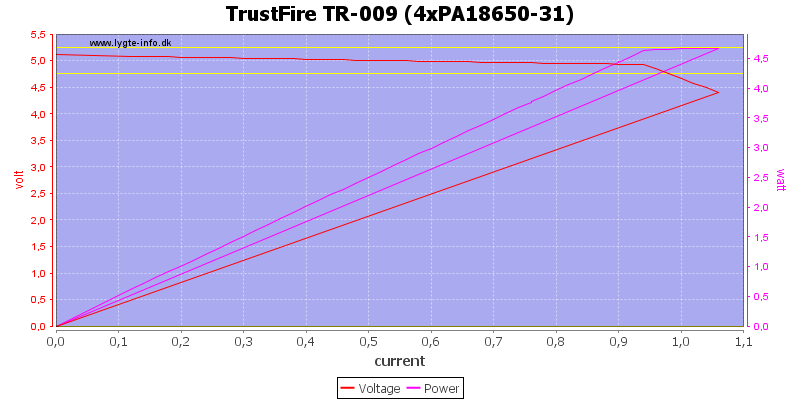 If the battery voltage drops below 4.23V the charger will restart. The other slots looks the same. With a older cell the charge voltage goes above the 4.25V limit. The same with this cell. 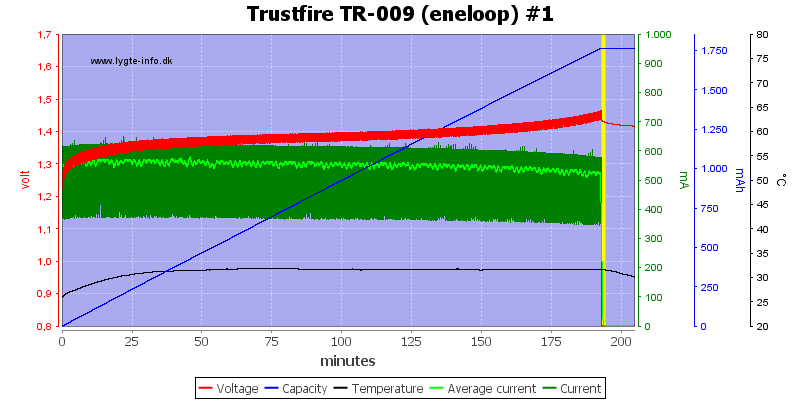 With 4 cells the charge speed is reduced. If using an external 12V supply it needs about 2.2A. 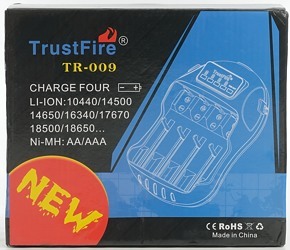 The charger starts immediately and measures the voltage with current off. With 4 cells the current is reduced, there is not time sharing between slots. 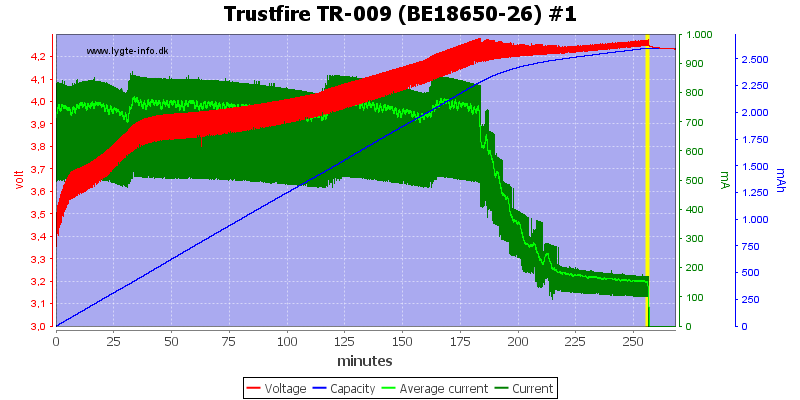 It looks like the charger stops on voltage before the cells are full. The high capacity cells has the same problem. And also the AAA cell. Exactly same problem with 4 cells. 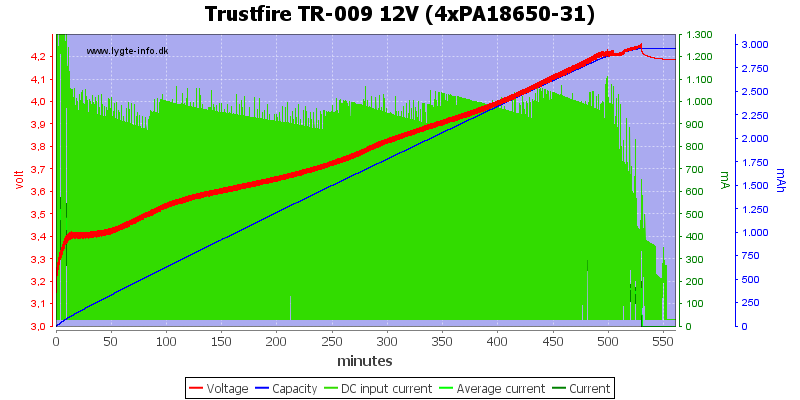 Maximum current from 12V is about 0.6A. 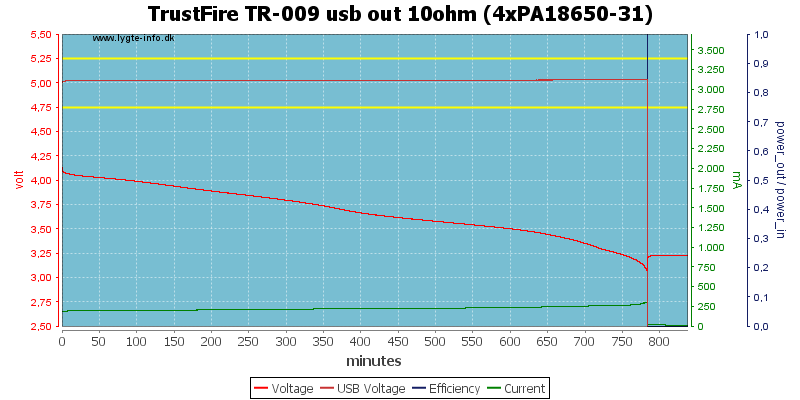 Usb coding is unknown (It is 2.4V on both data pins). 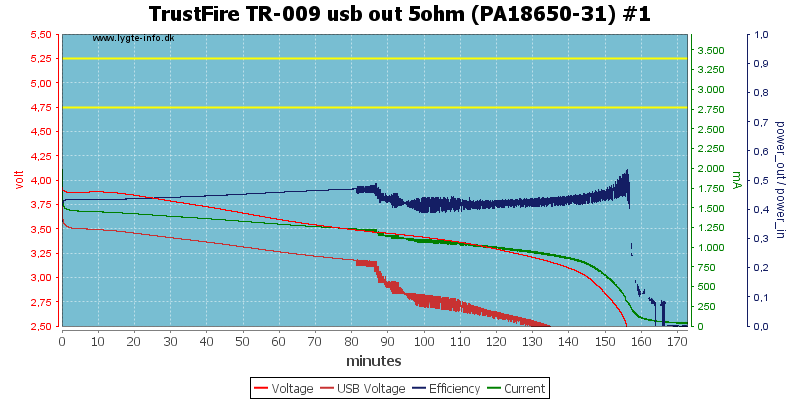 Usb output can only be supplied from batteries, not from mains. 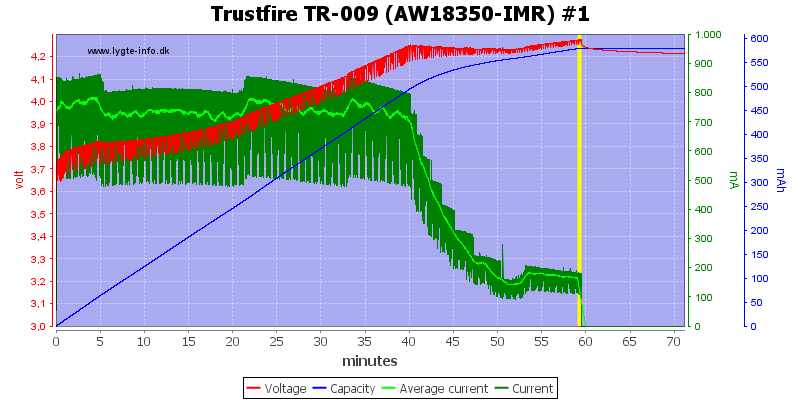 Will draw 0.4mA from battery with usb out turned off. 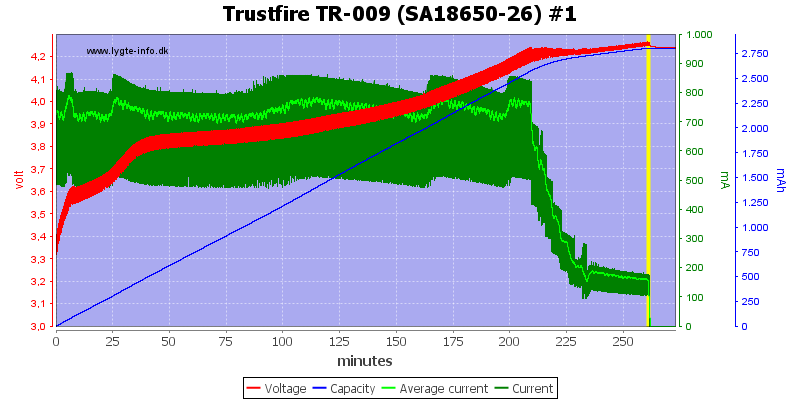 Will draw 20mA from battery with usb out turned on. Adding more batteries do not improve the output current. A single battery only gives about 20 minutes power at 0.5A, this is not very good. 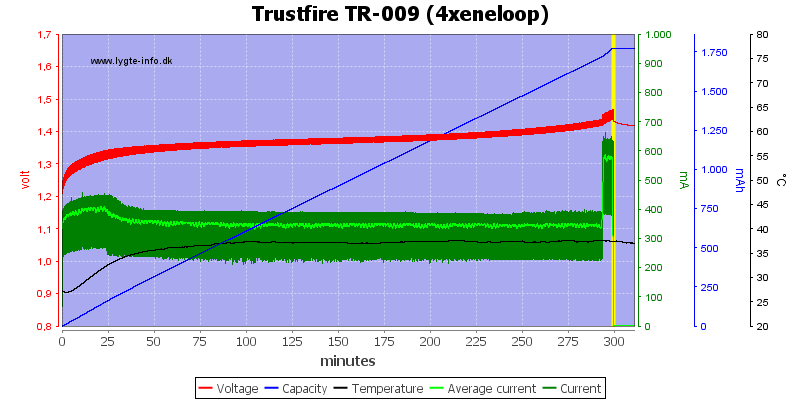 Using four cells is much better, there the output is stable for about 13 hours. 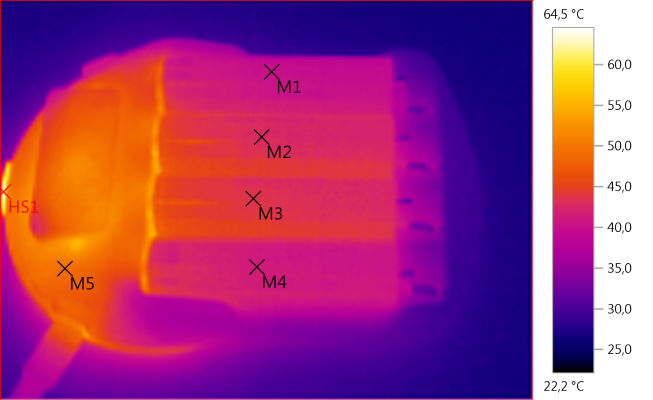 Using a 5 ohm resistor means 1A at 5 volt, i.e. slightly above the current limit. 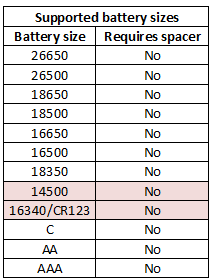 It cannot deliver anything useful on a single 18650 battery. 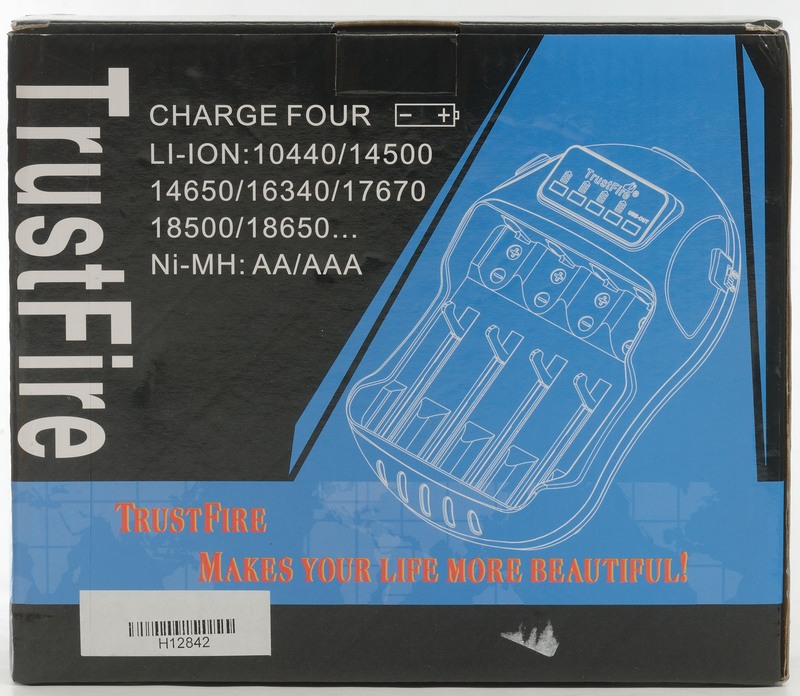 With four batteries it can keep the voltage up to nearly 5 volt for more than 5 hours. 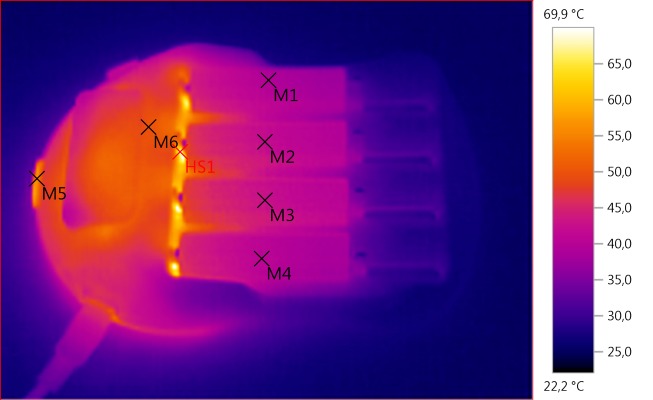 Noise is 134mV rms and 406mVpp. Noise is 207mV rms and 590mVpp, this is rather high. This is not really surprising because I am above the current limit. 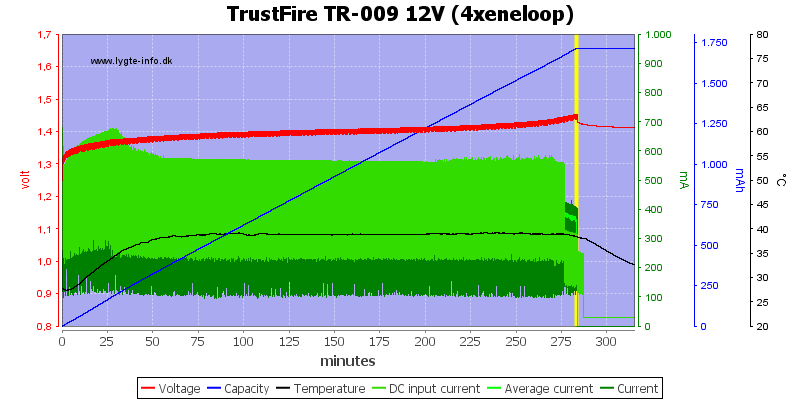 On LiIon this charger is good enough, but NiMH is not charged fully, a top-off charge would have fixed that. 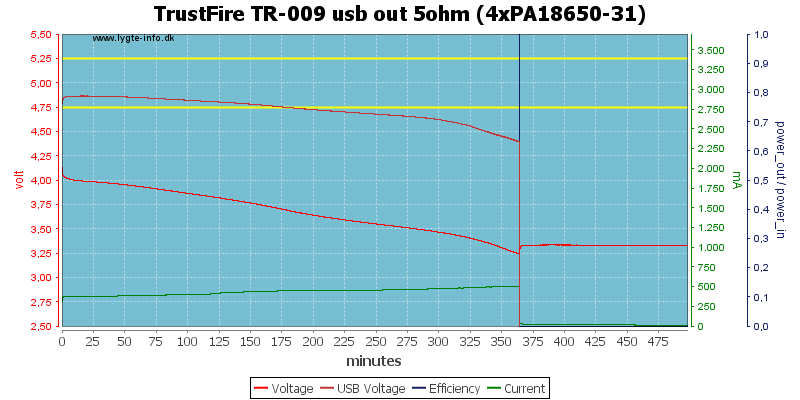 The usb output is fairly low current and needs more than one battery to work, the coding and the noise is not very good. All in all I will call it an acceptable charger. Thanks for the test. 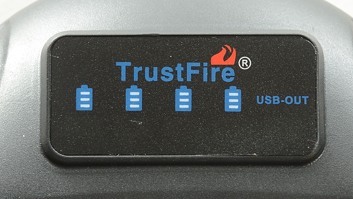 That is a pretty decent product from Trustfire, and the price that I found ($17.50 on Amazon) is good. But I think I would spend the extra money to buy a good charger (if I would need one).